Congested roads and inattentive drivers, place motorcycle operators at serious risk even when complying with all of the traffic rules. 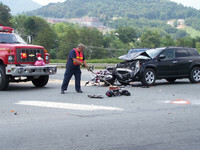 Collisions between motor vehicles and motorcycles often result the most serious injuries including fractures, disk herniations, brain damage and death. The Law Offices of Bloom & Kinnear have more than 23 years experience in representing seriously injured victims of such motorcycle accidents. If you or a loved one has been injured while operating a motorcycle, scooter or as a pedestrian, contact us online or call us at 305 860-1234 to set up a FREE consultation to discuss your case.